You must also incorporate some texture, (ie: fabric, ribbon, floss, etc) and a metal piece (ie: brad, push pin, charm, etc.). Make something pretty without going over the top in pinks! Heather Hilliard of House Beautiful circa Oct 2011, said that, 'A bright, happy blue becomes very sophisticated when paired with a neutral'. So, if you find you're having a bit of a struggle, let Heather's words help guide you. I paper pieced that sweet little dress and then accessorized the outfit with the pops of pink...and glitter glue...there was no requirement of glitter but this card was screaming for it. Seriously, what gal wouldn't like sparkly pink shoes?? GAH!! My metal accents were sort of sneaky (hope it's ok, Sharon) by using the silver jeweled brad and some silver metallic pearls. Metallic, but in a really "girly" way. Lastly, a shot of the inside of the card. I left it blank for now. It could easily be used for a thank you, a birthday or a "just because you are fantastic" card...because those are the best cards to send and receive! I sure hope you will play along with us this week at Our Creative Corner! Please stop by the site and see what the rest of the fabulous gals on the Design Team have whipped up, too. You will NOT be disappointed! You did a great job with the 'touch' of pink!!! Very proud of you keeping most of the pink in the drawer, I think you did a beautiful job with just the touches of pink and bling, gotta love bling. The pearl necklace is wonderful touch. Have a great weekend. This is too, too cute! I love the paper piecing and all your girly touches - it really looks wonderful even with only a little pink. ;) Beautiful job on the challenge! Sweet! Just the right touch of pink...I know that must have been difficult for you! 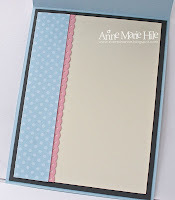 I think your card is stunning Anne Marie, inside & out! TFS and have a wonderful day! Fabulous! Love the paper piecing! Can't wait for life to settle down so I can play along with you at the OCC! How fun is this? Love your well dressed dress form with so many sweet hints of pink. A beautiful card! Great card! Your 'touches' of pink combined w/ all of that blue is lovely! Love the pearl necklace and those glittery heels are to die for! This is so pretty! You always have the perfect mix of papers and embellishments. Wow ... this is truly fantastic Anne Marie ... I love your clean, classy styling and the subtle additions of elegant glamour - pearls, glitter, silver jewels, metallic pearls ... oh my .... simply irresistable!!! Anne Marie, I just LOVE your card! and I love how you used your limited pink! I agree with you 100%, that glitter is girl-y, the pink jewel brad is perfect! I'm glad that you joined us, and I love the paper piecing! And I'd love to have a pair of pink glittery shoes! How cute is this? I love polka dots and stripes and this is just delightful - especially the paper piecing! Terrific girly girl feel to it and I adore! I think you hit the perfect combination of blue and pink. Really sensational job on this week's challenge! 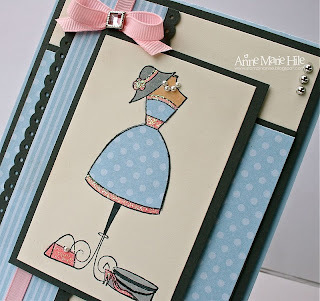 Love this gorgeous girly card, Perfection! !